Salem Memorializes Those Killed During Witch Trials : The Two-Way The memorial stands at the site where 19 innocent women and men were hanged. It opened on the 325th anniversary of the first mass execution of five women. The 19 men and women who were hanged at Proctor's Ledge during the Salem witch trials 325 years ago have been memorialized at the site of their deaths in Salem, Mass. The city of Salem, Mass., has opened a memorial to commemorate the people who were convicted and killed during its notorious series of "witch trials" in 1692. The memorial stands at the site where 19 innocent women and men were hanged. 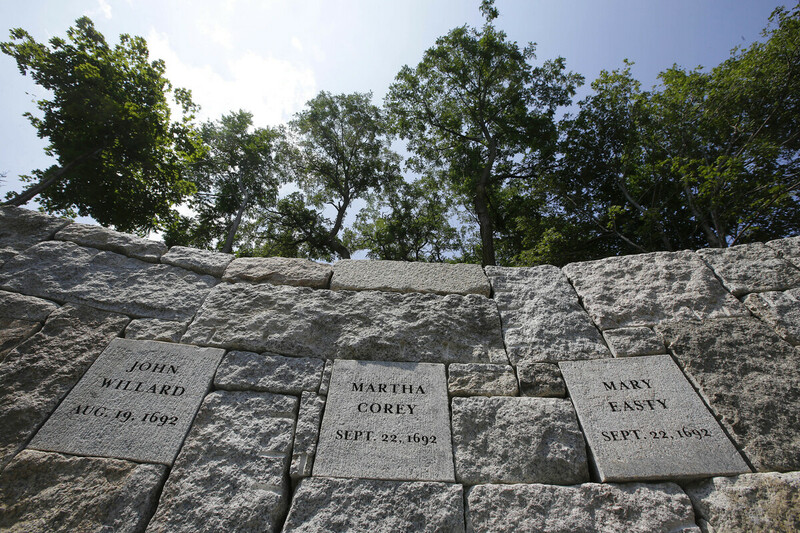 According to the city, the memorial opened on the 325th anniversary of the first of three mass executions at the site, when five women were killed: Sarah Good, Elizabeth Howe, Susannah Martin, Rebecca Nurse and Sarah Wildes. 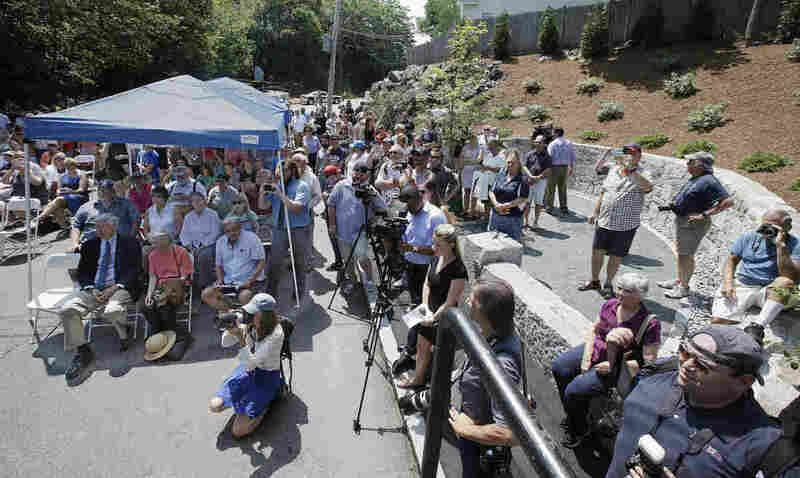 Andrea Shea of member station WBUR attended the ceremony at Proctor's Ledge and said Salem residents and descendants of those killed gathered to pay their respects. "We should not be here today. We should not be here dedicating this memorial and setting aside this small patch of rocky earth," the Rev. Jeffrey Barz-Snell of the First Church in Salem told the assembled crowd, Shea reported. "We should not be here commemorating the heartbreaking and tragic loss of life, people who were falsely and unjustly accused of being in the snare of the devil." Wednesday's dedication of a memorial honoring those executed during the Salem witch trials draws a crowd to where researchers say was the site of the hangings. The memorial consists of a slope that leads down to the site where the executions took place. There, a semicircular area is enclosed by a wall, which bears the names of the 19 people who were hanged. A single oak tree stands at the center, the city says, as a "symbol of endurance and dignity." Shea says that researchers pinpointed the location of the site in January 2016. Emerson "Tad" Baker, a professor at Salem State University, told her that the story resonates far beyond Salem because those accused have an estimated 100 million descendants. "In that sense, it really is our national story, our national shame and our national chance at redemption because you know if you're not a descendant of one of those people probably the person standing next to you is," Baker told Shea. The memorial was primarily funded with a $174,000 Community Preservation Act grant, though the city adds that it also received "dozens of small donations, many from descendants of those wrongfully executed at the site." According to The Boston Globe, 25 people were killed during the witch trials in Salem. "All 19 who were executed through a hanging died at Proctor's Ledge. Five others died in jail, and one was crushed to death," the paper reports. A previous version of this story said 19 people were hanged in mass executions. Only 18 of them were killed in mass executions.